Businesses today face a multitude of challenges, some of which I discussed in my last InFocus post. Businesses must be more competitive in existing and new markets; must be more innovative in their products and services by using new sources of information; and must be more efficient, reducing costs and using their employees more strategically. Numerous businesses have weathered the storms and capitalized on the opportunities that these challenges have presented. In some cases, the rapid change in market conditions propels transformations. In the case of Netflix, for example, the growth of high speed internet and the resultant customer expectations of consuming movies on demand, created a business crisis. Netflix leveraged the cloud to quickly create a streaming service that was both reliable and enhanced customer satisfaction through social features. This quick adaptation allowed them to compete better in a changing marketplace. The question is: How and where do you begin? A fundamental business transformation is required. Businesses must acquire new capabilities to both withstand competition in existing markets and contend in new markets with new products, services, and demands for higher levels of customer satisfaction. Technology is a key enabler; however, it is not about technology alone. For example, if a business can release products or enable features more quickly, or if sales can close deals faster by conducting product demos on demand, it will provide the business with valuable competitive differentiation. If organizations can onboard an employee in say 7 days, rather than the average 30 days it takes today, organizations can have a more productive workforce more quickly. These are defining times for IT organizations. They are faced with unrelenting pressure to maintain the infrastructure, while incorporating new, innovative capabilities. 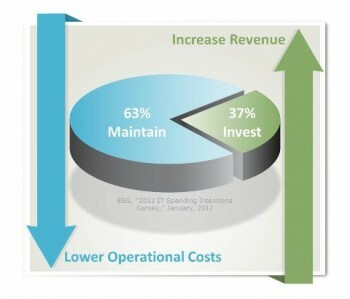 Most organizations spend close to 70% maintaining, and investing only 30% in new capabilities. This ratio must shift to a 50-50 split of creating new capabilities and keeping the lights on. The transformation requires a new business model for IT, leveraging virtualization and cloud as the technology elements, and embracing the new roles and skills – Cloud Architect, Converged Infrastructure Specialist, Service Manager, etc. – that this transformation requires. 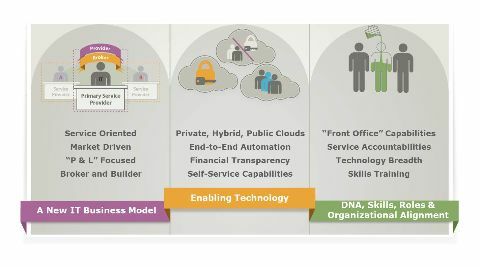 The new business model is services oriented and market driven. Technology enablement is accomplished through offering self-service capabilities powered by end-to-end automation. This has the additional advantage of driving standardization and lowering unit costs. New deployment models using private, public and hybrid clouds should be considered, keeping factors such as risk, compliance, criticality of data, nature of workloads, cost, etc. in mind. It is also important for IT to consider brokering certain services through external partners, while retaining critical activities within the company walls and fulfilling IT’s role as the custodian of corporate data. Education and training is a vital component of this transformation, especially for the new roles and the overall mindshare of employees. However, there isn’t a ready playbook or 10-step checklist to accomplish this transformation. Many organizations are in the midst of transforming and are in varying stages of progress. EMC’s own IT organization is well on its way to implementing an IT as a Service model. Piecing together what EMC has practically experienced in its own journey, as well as talking to other peer companies that have been on this path, EMC is now introducing new courses that will assist and guide you to enable your own business transformations. 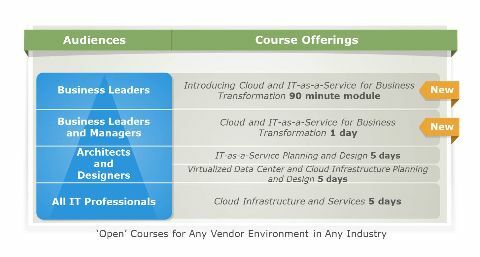 The new courses show business leaders and their teams how to leverage cloud computing and IT as a Service to help drive innovation, agility, and efficiency. They provide the definitions, concepts, core elements, skills, and strategies for developing a plan to implement a services-centric IT organization and provides a framework around which a business can assess their maturity and develop a strategic plan to enable the business transformation. The opportunities exist – to be more competitive, innovative and efficient. Businesses need to seize them now! Also, if you will be attending EMC World, please attend one of my sessions “Cloud Architect: Do You Have What it takes to lead the Transformation?” on Mon. May 6 at 2:30 pm, or Thurs. May 9 at 10 am.